Which horse racing tipster do you follow? As we near the calendar year end, here is how some popular tipsters are performing. Above figures are based on 10 unit stake (10 win or 5 ew as applicable). Good record eh? Last winning month was April. Raceclear: losing in December, just had a sequence of 23 losers broken by a half point ew on 9/2 winner. Lost in calendar months Sept, Oct and Nov and currently losing overall in 2015. Loss exceeds 57 points since Sept 1st. Betting Emporium: overall position, over 48,000 points staked for accumulative 1.3% win. Horses are better with 6.1% win overall but in 2015 they are losing heavily with substantial losses at all four feature meetings: Cheltenham, Aintree, Royal Ascot and Goodwood. These festivals total 17 days racing with a loss of over 300 points. As for Ben Linfoot (under the value bet banner) don't have the full figures but I understand he is currently on a 58-selection losing streak.. This wine comes from the Bordeaux region of South West France, the home of some of the world's finest wines. Maison Calvet have been at the forefront of Bordeaux wine production since it was founded almost 200 years ago. Grapes sourced in the area of Entre deux Mers. The state of the vineyard during the year, and the grape ripeness and the sanitary situation before harvest are followed by our technical team in collaboration with our suppliers. A close technical collaboration also takes place during the vinification and ageing in order to obtain a profile respecting our commercial target. This elegant wine is softly oaked with hints of citrus and vanilla spice. Perfect on its own or with chicken or seafood dishes. This wine is ideal for drinking now but can be kept for up to three years. Some thoughts on the Punchestown meeting 14/15 November. Perhaps more important: two good restaurant recommendations! There could be hell toupee..
Having looked down and out after losing two matches in the round-robin, the player they call the professor then beats the players ranked two (Halep), three (Muguruza) and five (Kvitova) in the world to take the title. She traded as high as 110.0 on betfair during the tournament. Radwanska has won the biggest tournament of her career (and two million dollars). It's been a losing week on the blog (thanks to too much involvement in the Breeders' Cup) however it's nice to end the service with a winning bet. We didn't win much on the WTA finals though because A-Rad's earlier match losses referred to above prevented her winning the group. There's a good example today as to why it's fruitless to carry on betting. So, a waste of everyone's time I think you'll agree. There will be around eight or nine long term ante-post bets carried forward to 2016 and beyond. The football wagers look toast. But the political wagers are more promising in particular: 20/1 Trump Republican nominee, 12/1 George Osborne next Con leader and Teresa May 20/1 & 12/1 next Con leader. Good luck with your bets going forward. Despite the large number of meetings today I'm not having any bets on the horses. I could never be an in-running trader in these sprints. Too hard to read. When Rosina was outpaced and about ten lengths behind the leader I was thinking - this cannot possibly win. Wins by two lengths going away. In my second race Jebediah Shine broke fast to try and make all, setting the race up for a closer. Deep in the final furlong I'm thinking - where's the line? Just holds on by a fast diminishing head. The upshot of all this excitement is two winners from the two selected @ 3/1 and @ 4/1 (BOG) and @ 19/1 double. A welcome return of 38 points for the five points staked. I hope you were on today. Not sure whether I'll play tomorrow. If I do I will publish before 10am. My TGS premier league selections have started poorly. Unlike Callum Wilson of Bournemouth who is joint-leader at this very early stage on four goals. Following his hat-trick against West Ham he was on the score sheet against Leicester yesterday with a spectacular overhead kick. He was announced the man of the match. Very unlikely that he can win this playing for a promoted team, however an outside chance of finishing in the top four I would suggest. After the International break you'd fancy Bournemouth picking up more points against Norwich, Sunderland and Stoke. Could Wilson be this season's Harry Kane?! No good yesterday in the Goodwood race. In the tennis markets Boylesports eventually removed their ew facility in the quarter betting. Fortunately it was many hours after I pointed out the market on the blog so some readers may have got a bet. Small football and tennis bets to follow. Going to stick with the bets I've already published. Both Goodwood horses are 10/1 with William Hill as I write and Bencic is still currently available for the quarter-final suggestion with Boylesports. A bookmaker not known for laying bets is offering a bit of value in this market. Normally this market is win only i.e. you are betting on the player to reach the semi-final from their particular quarter. Boylesports however are offing ew 1/3 odds 1,2. So with an ew bet the place terms payout if your selection reaches the quarter-final. Further bets before 10am tomorrow. Well there we have it. Plenty of 20/1 Hoof It available at the time of blogging. Very heavily backed early afternoon into 8/1. Needless to say finishes fifth, one place outside the EW money. One firm is offering ew first five but only offers 8/1 each of my choices. I'll stick with the above. Might have further bets tomorrow, if I do I will blog anything I think would be of interest before 10am. Will probably have a couple of wagers tomorrow. Horses and maybe tennis quarter bets. With Federer's comprehensive wins over Murray and Djokovic in Cincinnati he regained the number two spot from the Scot. Consequently he will be seeded two at next week's U.S. Open and is guaranteed not to meet Djokovic again unless the world's top two players contest the final. Who could Federer meet in the semi? Well on the seeding it would be either Murray or Nishikori. The H2H with the Japanese player is 3-2 Federer. They haven't met in 2015 but Fed won the latest two meets in 2014. As for Murray, he can't break Roger's serve. It's something like 35 service games since the Scot achieved a break of the Swiss serve. And of course Roger has won their last five meetings. Trump now 9/2 with the northern geriartic layer (6/1 best elsewhere) for U.S. Republican Candidate. One of my two ew selections for the ladies' US Open will lose tonight in the first round of this week's WTA tournament. 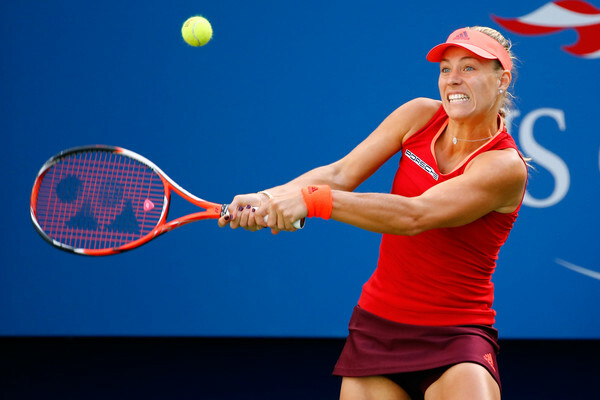 Not a difficult prediction as (50/1) Kerber takes on (33/1) Bencic. Kerber is favourite for the match and normally I'd be interested in Bencic at around 13/8 for the encounter as she won their only previous match in straight sets in August 2014. However with all the exertions of winning the Rogers' Cup last week the Swiss Miss could be fatigued. I'll be happy to watch the match live on BT Sport around 20:00. I particularly like Eccleston the sole representative of the O'Meara stable. The trainer has won this race in three of the last four years including last year. Might have a further bet in the morning. If so will post before 11:00 am. I hope the GSW Handicap is still one of my favourite races at 15:45 tomorrow! More reduced fields because of the weather. Going to have a bet at Nottingham. Will post by 11:00.. Rain playing havoc with the going and non-runners. Two poor races for us at Salisbury and Beverley. Our only chance of a return was 16:55 Salisbury as Lingfield selection, Ohsosecret, doesn't go. On the 3/1 favourite Quite A Story @ 9/2 and Hipz @ 10/1. Latter well supported immediately before race to 11/2. When exiting stalls Quite A Story unseats A Kirby. Loose horse continues to compete and interferes with Hipz a furlong or so out. Hipz looks as though he could be caught by Capelita on the line. Latter was threes-on in the photo with betfair to have got up. However Hipz wins by a nose. I'll take that. Quite a story indeed. All selections are BOG. Total nine points staked. That was a horrible race at Beverley with See Vermont squeezed for room in the closing stages and beaten just two heads. Well supported too down to 7/2 at the off. Here is something to take your mind off that (if you backed it). America will be anticipating Serena Williams completing a calendar grand slam at the U.S. Open in a few weeks time and in the process moving level with Graf on 22 grand slam wins. She is a short price to accomplish this at no better than 6/5. G Lee's mounts at Ascot yesterday never reached the winners' enclosure although two of the mounts I mentioned finished second beaten a s.h and 1/2 length respectively. As with the Lingfield selection however, nothing to come. Really can't get excited about any bets today other than the jockey bet I've already had. I think the Shergar Cup will be entertaining to watch but I am not considering any single horse bets at Ascot. You can argue that Blake Shinn has the best mounts at Ascot Saturday, that's why most bookmakers have him favourite to win the top jockey accolade. I think the value though lies with Graham Lee whose five mounts can all be fancied for various reasons. His 13:30 and 15:50 rides are Pricewise selections (chosen by Paul Kealy this week). In between Balding's Elbereth, Earth Drummer for inform David O'Meara and Johnson's Polarisation could all be in the shake up. I may have some further bets Saturday and if I do they will be posted by 10:00am. Just to confirm the details of yesterday's Kempton winner. Classical Rose was subject to 30p rule4 deduction because of the withdrawal of the favourite. This means the odds taken of 14/1 were reduced to 9.8/1. Still a nice payout and a bit better than the S.P. odds (8/1). No bet today and unlikely to be a bet tomorrow. If I do have a bet Friday I will post it by 09:30 am. That's it for the horses Wednesday. Only one winner (Ridge Ranger 16/1) but four good priced ew placed bets means an overall profit at the Sussex venue: stakes 28 points, returns 38.75 points, profit 10.75 points. Hope you managed to make it pay. Quite a few races I could get involved in today however I'm sticking to Goodwood. People are talking up Richard Hughes winning the Stewards' Cup on Ninjago this afternoon on his last day in the saddle. He may well do this but he has, I think, an even better chance of a winner in the consolation race at 14:00. He rides last year's winner Barnet Fair.